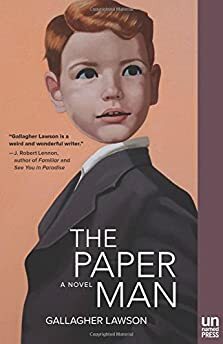 Largehearted Boy: Book Notes - Gallagher Lawson "The Paper Man"
Book Notes - Gallagher Lawson "The Paper Man"
Gallagher Lawson's startlingly original novel The Paper Man is a fantastic debut in every sense, a bold exploration of identity and art. "Lawson's dark vision proves both intriguing and disturbing, partially summed up when one character says to another, 'Creativity is nothing more than transferring emotions, mostly anxiety and fear, to the outside world.' But, of course, ultimately it is more than that. This is an unusual story about art's costs and its capacity for exploitation, political influence, and profound change–and for its ability, finally, to humanize." A perfect overture for The Paper Man. It might even encapsulate the entire book. This fourth movement of Shostakovich's trio begins with a funny little motif that is played upon throughout the piece by the various instruments. Sometimes the strings are working together and the piano accompanies; other times they are competing to be the melody. Sometimes the motifs repeat so many times it feels like it's being drilled into our heads, but after awhile, similar to when you repeat a word so many times that it loses its meaning and it feels like a foreign word, this piece will disorient you by the end with its glassy strings. Thematically, the novel looks at identity, and all of the characters, along with the setting of the city by the sea, are undergoing a kind of identity crisis, trying on each other's voices and styles, and then struggling to stand out. The same occurs in this fantastic, final movement of the trio. There's a scene in Fellini's La città delle donne where Marcello is trying to make it back to the train station. On the way he is picked up by a teenage girl and her friends in a convertible, where they proceed to blast this song by Gino Soccio while waiting at the end of a tarmac. When a plane appears to be landing, one of the girls withdraws a pistol from her purse and prepares to shoot it down. I imagine Michael hearing this song playing when he arrives in the city by the sea, and everything looks so strange to him, like visitors from another planet, but really Michael is the visitor, the outsider, who especially stands out because his body is made of paper. Bonaparte's "Anti Anti" is a perfect anthem song for those living in the city by the sea who are resisting the sudden interest that the northern continent has taken in their home. They know that the north plans to take away their livelihood and increase the cost of living and understand their power over their home, because, as Bonaparte says, "They drive a limousine, but we ride a bike; they own the factory, but we're on strike. Anti anti!" Ominous synth strings are a favorite sound of mine. Add some Scandinavian Skweee blips and beats, and I'm hooked. This song by Ya Tosiba illustrates the atmosphere of the city along the coast of a peninsula. The lyrics use old texts from Azeri language, and loosely are about the sudden increase of vehicles on the streets. In the novel, art is the suddenly increasing object, sometimes as a form of protest, sometimes as a thing of beauty in a weary world, and sometimes as a thing of power and danger. Stereo Total is one of my favorite bands because of their blend of styles and languages. They sing in so many languages about so many things that they are like musical chameleons. This song seemed especially fitting for the novel, as it's about an artist, and it's not in English. The chorus, simply the artist's name repeated, uses such bittersweet chords. It reminds me of Doppelmann, the artist of the novel, whose reputation ultimately supersedes himself. This song is incredible. It reminds me of the decadence of Mischa, the woman from Michael's past while living inland. Michael is surprised to see her all grown up, and her fascination with his unusual body. A celebration of life, of beauty, of the self before others, this song has the character of Mischa pegged perfectly. Michael's mixed feelings for everyone in the city deserve a simple, unadorned song like this androgynous-sounding one from The Zombies. Michael confuses kindness from Maiko, the unemployed fur model, as love; he confuses the past with Mischa as love; and the help from the artistic hands of Doppelmann as love. And yet Michael knows not one of them can love a man with a paper body, so he keeps his feelings to himself. In the middle of the novel, Michael is forced to work in the display window of a department store, where he dances with mannequins and reenacts scene from radio plays. This song by Tom Waits is a good example of the kind of slightly dissonant, crackly songs that played through the speakers outside the display window while Michael stomped on the floorboards with the stiff mannequins. As Michael searches for his own identity, he decides to imitate the artist Doppelmann. Things begin to get carried away, and he finds himself trapped in a web of lies and paper masks. The lines "The whole world lied / They said he was a saint / But I know he ain't," nicely describes Michael at this stage in his journey. The opening line "We came down from the north," fits the atmosphere of the book. But in general, the aesthetics of the band The Knife have influenced me for a long time. The music video for this song haunted me for a long time after seeing it, especially the animation by the artist Motomichi Nakamura. In this song, in the middle they alter Karin's voice to sound more masculine as she sings: "Say you like it, say you need it when you don't." This masochistic command reminds me of Michael's treatment of himself and his body, and how he thinks he deserves the treatment he gets as an outsider. I also love when songs can layer over earlier sections. The opening verses of this song are layered over the middle refrain, and you suddenly have voices competing, then complementing each other. Similar to the Shostakovich piece, there's a lot of tension and anxiety from songs that have voices straining against each other, just as the characters in the novel do the same with each other. Without giving too much away, at the end of the book, there is a large masquerade in the city streets. What perfect way to end this playlist, then, with the stately, romantic, slightly terrifying waltz that comes from Khachaturian?